"I have never made anything like this before ... it (crokinole board) turned out better than I hoped." 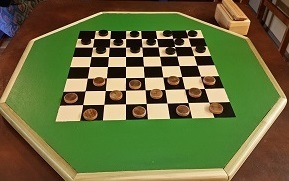 (Customer added his own checkers pattern on the underside of the board). "Just thought I would drop you a note and say that I really enjoyed making the ( baseball ) game. I went with a Detroit Tigers theme. "I made the (skittle-maze) game out of light oak ... It went together really well ... It's as much fun now as it was 40 years ago in college!" 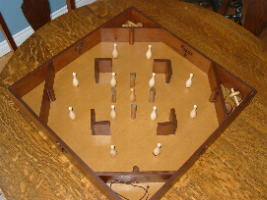 "Thanks again for the (carrom) plans. This was my first project, and I'm really happy with the way it turned out. Thanks for the extra e-mail advice, too." 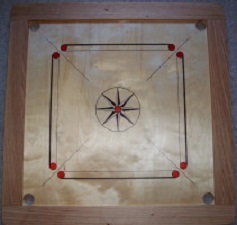 "The (carrom board) plans ... were very informative with clear instructions. 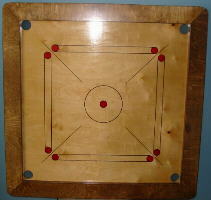 ... the board looks beautiful and plays very well and true. Many thanks. "Plans ( carrom & skittle-maze ) were easy to follow and both games turned out well ... we are really enjoying them." 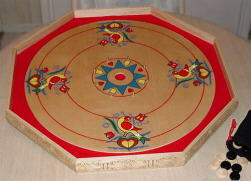 "Thanks again for the (crokinole) plans and disks ... I painted it with Pennsylvania Dutch designs from familiar "hex signs", since our family is PA Dutch. The Thistle Finch stands for good fortune, the hearts for love and family, the tulips for faith." "The (baseball & hockey) plans have been excellent. For the baseball game. I painted the players to resemble the 1960 World Series -- Mazeroski of the Pirates vs. Terry in Yankee pinstripes. ... friends were impressed with 'retro' appearance and the fast paced action. ... took only a few 'warm-up' pitches to get them hooked." 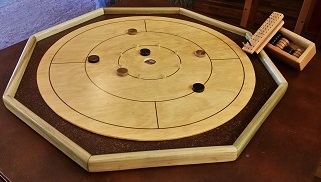 Nutley, NJ "I built a Crokinole Board from your plans and it turned out beautifully. ... I used Tung Oil as the finish, followed by a couple of coats of Brazilian Carnauba (car) wax." ... uses our woodworking plans to produce hand crafted hockey games for sale. 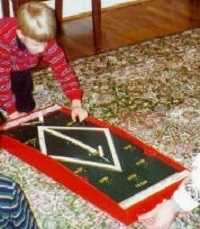 Edmonton, Canada "Thanks for the plans for the Crokinole Board: ... it is swiftly becoming a family favorite! The plans were very clear and easy to build." 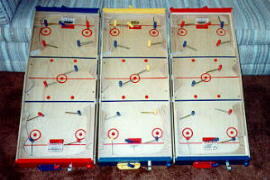 "I wanted to let you know that I built 3 Vintage Hockey Games from your plans. Two of them for my sons and one for a friend. ... the best (plans) I have worked from." "It's a pleasure to see such attention to customer service." ... used our woodworking plans to build this baseball game project for his grandsons for Christmas. Muskegon, MI. "Nice job with the (hockey game) plans ! Very complete and well done. Please send additional (hardware) order forms. Do you have any other plans ?" England. "I am now a committed crokinole fan. I made a simple board to get started, and intend to get working on a slightly more refined one soon. I may well come back to you for more disks, as I intend to spread the game throughout the family!" Arcadia, CA "I have to congratulate you on the (baseball) plans ... nice and clear. I get a lot of wood working plans through the mail, and yours are the best." 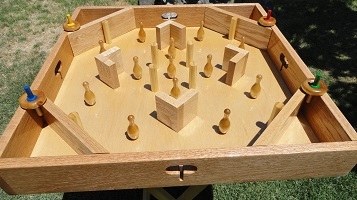 "I built a hockey game from your wood working plans and I am delighted with the results. The plans are excellent." Aloha, OR "I just received two (chair plans) that I ordered from your company. ... your service and product (are) excellent." Winnipeg, Canada "I was pleased with your product (hockey plans and hardware kit) and I am now ordering the baseball game plans and hardware. Thank you once again." Ayrshire, Scotland "I have completed the baseball game. Kids love it. ... Will have a go at hockey (game) after summer holidays."